Cuba, Ely Chapter of Lambda Alpha International, Old Havana, Cienfuegos, Ernest Hemingway, To The Point, Movie Matinee "Juarez"
CUBA: A trip of a lifetime. For me the opportunity to visit Cuba came when my friend Charlie A. Serrano, a mission coordinator, invited me to go come along with the Ely Chapter of Lambda Alpha International delegates. Lambda Alpha obtained a license to visit Cuba from January 6 to January 13, 2013 through the U.S. Dept. of the Treasury “People to People” program as a professional academic and cultural research exchange mission. Lambda Alpha began in 1930, has chapters all over the world and is the Honorary Society for the Advancement of Land Economics. The mission was in collaboration with the Antonio Nunez Jimenez Foundation in Cuba. OUR GROUP of 27 delegates consisted of professionals from every discipline: lawyers, architects, land developers, building managers, transportation planners, environmentalists, property managers and city officials. Except me. I was the only Mexican-American community representative in the group. MY JOURNEY began with meeting the Lambda Alpha delegates, Coordinator Serrano and his assistant, Carlos Jimenez, at the Miami airport. From Miami, we boarded an American Airline charter plane which took approximately 25 minutes to land in Havana, the largest city in Cuba. Once through Cuban customs, we boarded a modern air conditioned bus which was built in China but had an American motor. Our Cuba guide on the bus was Alejandro Infante a.k.a. “Allie”. Allie did a great job sharing a lot of information about Cuba. THE FIRST thing you notice in Cuba, besides the heat, [in fact the temperature the entire week was 83 to 85 degrees] were the cars. It seemed as if Cuba was frozen in the 1950’s. Most Havana taxies were Chevy’s from 1959 and down. I rode in a 1952, 1953, and 1954 Chevrolet and I was impressed on how well the 60 year old cars were preserved; vibrant and shiny. I was told most of the cars have different motors, with some of them even having diesel motors. THE CITIES we visited were Havana, Pinar de Rio, Cienfuegos and Trinidad. All of them beautiful, unique, exotic, and rustic. At the Antonio Nunez Jimenez Foundation, we saw a Cuba museum and heard a lecture about land development in Cuba. A meeting was held with representatives [Cuban Lawyers Assn.] of the National Justice Union of Cuba [Union Nacional de Juristas de Cuba] at their headquarters. Introductions were made in Spanish by Cuban Justice Dra. Dorys Quintana Cruz. Cuba is a Spanish speaking country and my Spanish helped our group throughout the trip. During that meeting we were told how several of Cuba laws are changing relative to business and land ownership. IN OLD HAVANA, I visited the hotel room of Ernest Hemingway at Hotel Ambos Mundos. It cost two pesos to enter a small room with a single bed, dresser, table, two chairs and a book shelf. Pictures of Hemingway with movie stars lay on his bed. Our guide said Hemingway drank twelve Daiquiri Rum or a.k.a. “Papa Doble” every night at El Floridita, a local bar. August Sallas holding cigars made by Benito. IN CIENFUEGOS [100 Fires]: We made an impromptu visit to the tobacco farm of farmer Benito. Benito welcomed us into his home and gave us a tour of his large tobacco barn, explaining his work as a tobacco farmer. He gave us a quick demonstration on how Cuba cigars are made and gave us the samples to smoke and enjoy. Cuba was wonderful to visit. It is a warm and friendly country whose people are beautiful, courteous and kind. My Cuba trip will be continued. 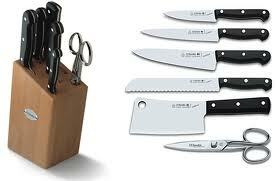 TO THE POINT: Do you need your knives or scissors sharpened? To The Point sharpening business will set-up shop at the Little Village Community Council, 3610 W. 26th St. to sharpen knives and scissors from 10 a.m. to 2 p.m. Sunday, Feb. 24, 2013. No appointment necessary. First come, first serve. PRICES: Pocket knives $2, Blades up to 4” $3, Blades up to 6” $4, Blades up to 8” $5, Blades up to 12” $6 and scissors $5 - $7. MOVIE MATINEE: The movie “Juarez” starring Paul Muni, Bette Davis, Claude Rains and John Garfield made in 1939 by Warner Bros. will be featured at the Little Village Community Council, 3610 W. 26th at 1 p.m. Saturday, Feb. 23, 2013. Public invited. FREE ADMISSION.